One of New Zealand’s most exhibited overseas artists has set up a new series at a restaurant in Kaikoura. Ruth Stirnimann has featured her works in 20 international art fairs and exhibitions in Rome, Mannheim, Sao Paolo, Rio de Janeiro, Milan, Miami, Berlin, Strasbourg, Basel, Lisbon, New York and Paris, Santa Fé and Dallas in the last 18 months. Earlier this year she won a major prize at an international arts festival in Rome and she has focused most of her work to be shown overseas. Her works have sold in many countries including Germany, Switzerland, USA, England, France, Italy and Australia but her latest series is currently on display at her family owned and operated restaurant, Passione, in the small South Island tourist town of Kaikoura. This is providing many New Zealanders the opportunity of viewing her unique style. “I also received an excellence award for my geometric works seen shown at the Carrousel Du Louvre in Paris this year and I won the Marco Polo Award as Art Ambassador in Venice a few months ago. “My works are now seen at the Passione restaurant, which has become my main gallery in New Zealand. 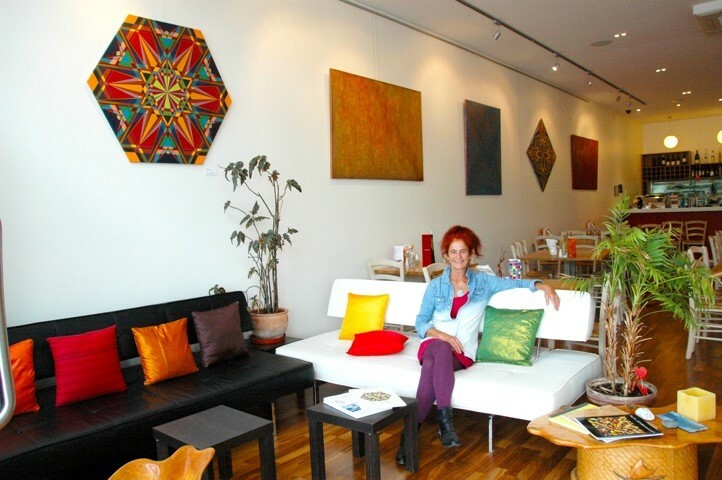 My works have no specific New Zealand theme but they radiate and created harmony and balance, so it has a positive effect on New Zealand people and tourists who dine at Passione in Kaikoura. “A woman tourist from the US started to cry the other day when she saw my art and when she realised, that I was the artist. She was so touched by the paintings so it added value to her visit to New Zealand. “The biggest benefit for New Zealand and Kaikoura is that I am representing Kaikoura and New Zealand in all the international exhibitions, art fairs and art books and I constantly promote this great country. I believe this is a huge value for New Zealand. “Someone from Kaikoura by chance visited the International Art Fair in Santa Fé this year and saw my works there and she could not believe that I was exhibiting there. Luckily the woman curating the Santa Fé event knew all about me and Kaikoura which is great for New Zealand. The Passione restaurant has Stirnimann’s son Livio Fromm as head chef and her daughter Piera Fromm as front of house manager. Their menu includes fresh fish caught in Kaikoura local vegetables and herbs. Their wines are not just from Marlborough but also Switzerland and Tuscany in Italy.